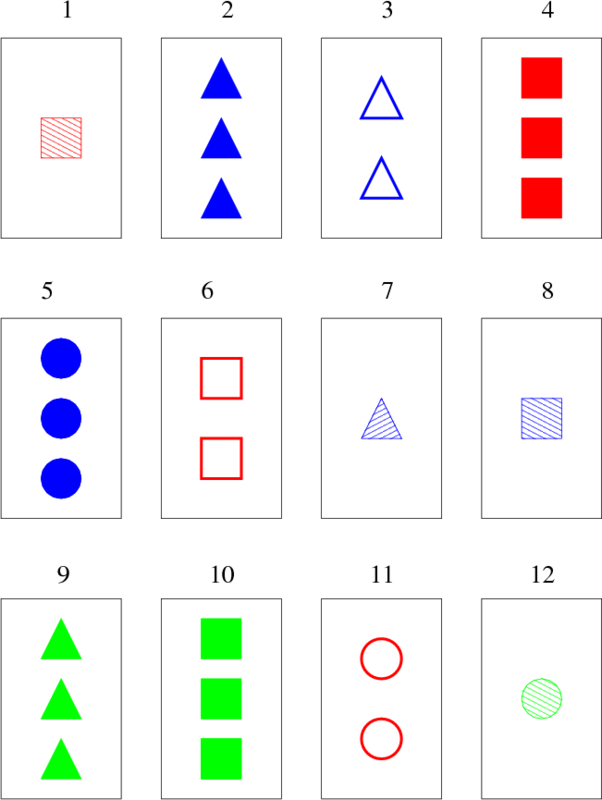 Each of the cards is uniquely identified by its four properties: the shape shown in the picture (square, triangle, circle), the count of these shapes (one, two, three), their color (red, green, blue), and the fill style (empty, striped or full). For each combination of values there is exactly one such card in the deck. Thus the total number of cards in the deck of the original game is 34 = 81. In the picture below, the cards 1, 4, and 6 form a Set: they are all red, all are squares, the counts are different, and so are the fill types. The cards 2, 3, and 9 do not form a Set, for example because two of them are blue and one is not. In this problem we will play a more general version of the game. There will be N card properties, and for each of these properties there will be M different values it can obtain. The deck will contain exactly one card for each possible combination of properties. Thus there will be MN cards in the deck. In this more general game, a Set consists of exactly M cards such that for each of the N properties the following holds: Either all the cards have the same value of this property, or all of them have different values. Each test case looks as follows: The first line contains three positive integer N, M and K giving the number of different properties of the cards, the number of different values of a single property, and the number of cards drawn. Each of the next K lines describes one of these cards. The i-th of these lines (1 ≤ i ≤ K) contains exactly N numbers pi,j (1 ≤ j ≤ N), 1 ≤ pi,j ≤ M. Value pi,j is the value of the j-th property of the i-the card. For each test case output a single line with a single integer – the number of different Sets that can be made from the given cards. This example input corresponds to the image in the problem statement. The four properties are described in this order: shape (square, triangle, circle), count (one, two, three pieces), color (red, green, blue) and fill style (empty, striped, full). These are the 11 different sets: (1,4,6), (1,7,12), (2,3,7), (2,6,12), (3,4,12), (3,5,8), (4,5,9), (5,11,12), (6,8,10), (7,10,11), and (8,9,11).